The sustainability and productivity of agroecosystems depends exquisitely on the functionality of a framework of plant–soil interactions where microbial populations, including both mutualistic symbionts and saprophytic microorganisms, living at the root–soil interfaces, the rhizosphere, are involved. Among various beneficial and consumable plant species, legumes form useful symbiotic relationships with two types of soil microbiota: N2-fixing bacteria, often called rhizobia, and arbuscular mycorrhizal (AM) fungi. Also, the legume rhizosphere inhabits other valuable microbes such as plant growth-promoting rhizobacteria (PGPR). These microorganisms interact intensely among themselves, and with legume roots, to develop the multifunctional legume mycorrhizosphere, a microcosm environment of variable activities, appropriate for legume productivity. 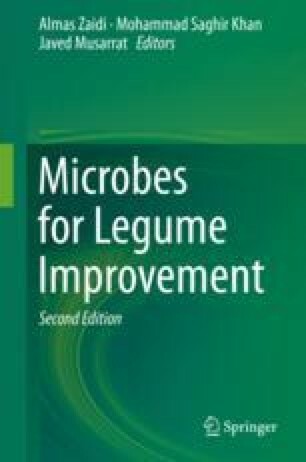 This chapter highlights (1) the types of microorganisms and processes involved in the establishment and functioning of the mycorrhizosphere, (2) the impact of the mycorrhizosphere activities on legume production, and (3) the possibilities to tailor an efficient mycorrhizosphere as a biotechnological tool to improve legume performance in different production systems following efficient rhizobial, PGPR, and AM fungal inoculants. This research was supported by the Andalusian Research Programme (Project CVI-7640) and the Spanish National Research Programme (R & D)-European Union (Feder) (Project CGL2015-69118-C2-2-P).